A pouf packed with plants, a faceted flat-packed hideaway and a big ball of twine are among the shelters that Los Angeles-based architects and designers have created for the city's stray cats. The 13 outdoor shelters were created as part of the annual Giving Shelter fundraiser for FixNation – for the Architects for Animals charity based in the city. The designs will be auctioned online to raise money for the organisation, which offers spay and neuter services to feral, abandoned and stray cats. The cause is particularly important in Los Angeles, which has one of the largest amounts of homeless cats in the US, estimated between one to three million. Three white tubes criss-cross at a central point to form this shelter, which Abramson Teiger Architects designed as a bigger version of the pronged toys known as Jacks. In this take, cats can walk up the holes in the tubes to tip them over. Abramson Teiger Architects' second shelter resembles a large ball of woven string punctured with a circular opening for cats to clamber inside. A length of left-over material wraps the base for them to play with. Described as a "cathedral" for cats, CallisonRTKL's design includes a pointed roof, colourful glass windows and a miniature disco ball. A carpeted ramp leads up from at the rear into a sleeping nook fronted with a big triangular opening. 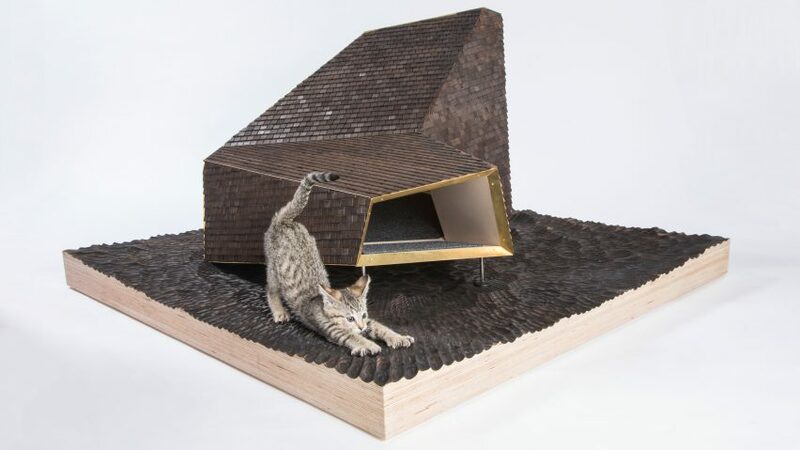 Sourcing trash materials from alleyways, D3 Architecture has looped and twisted an abandoned metallic air-conditioning duct to create a passageway for cats. A bed is suspended in the middle and held up by suspension wires attached to the outer steel frame. A number of cats can occupy the space inside this faceted orange structure, which is made up of plywood triangles joined by aluminium piano hinges. The team based the structure on paper origami, designing it to be flat-packed and easily moved elsewhere. Spanish moss and Korean grass are packed in between recycled plastic ribs to create Flor-Gato, which has a dual function of providing shelter to cats and a seat for the charity's volunteers. Three bird houses sprout from the slatted wooden frame of HKS Architects' cat den, which is shaped like a fish. It is sliced in half to create the entrance on one side, and tapers towards the end to form a tail on the other side. Global firm HOK has stacked and wrapped white felt-lined pipes to create seven cosy sleeping chambers for kittens. Faux wood is placed on the exterior of the tubes to protect them and make it suitable for both indoor and outdoor use. Tiny shingles clad this angular structure by fabrication laboratory and design studio Knowhow Shop. Set on a feather-covered base, it is formed of two volumes fronted with irregular-shaped openings. Two halves of a blue "W" sandwich the circular structure in Kollin Altomare Architects' design. A pair of ramps lead up from either side to the central wooden platform, where cats can scratch a material pole. Perkins+Will built this coil-shaped shelter using a series of wooden grids. The structure comes as a kit of parts and can be reassembled in different ways. The arch of a cat's back informed Stantec when shaping the two curved plywood frames that make up this shelter. Red string is pulled taut between the wood for the cats to play with, while a faux fur white bed is set below for sleeping. Raised on brass legs, this circular concrete shelter by Standard Architecture is split in two with louvres made of reclaimed wood. The slats can move to open up in warmer weather or close the openings in colder climates.